The personal pronouns in Russian are arguably the easiest to learn. 1) ТЫ: is used when speaking to friends, children, family members. 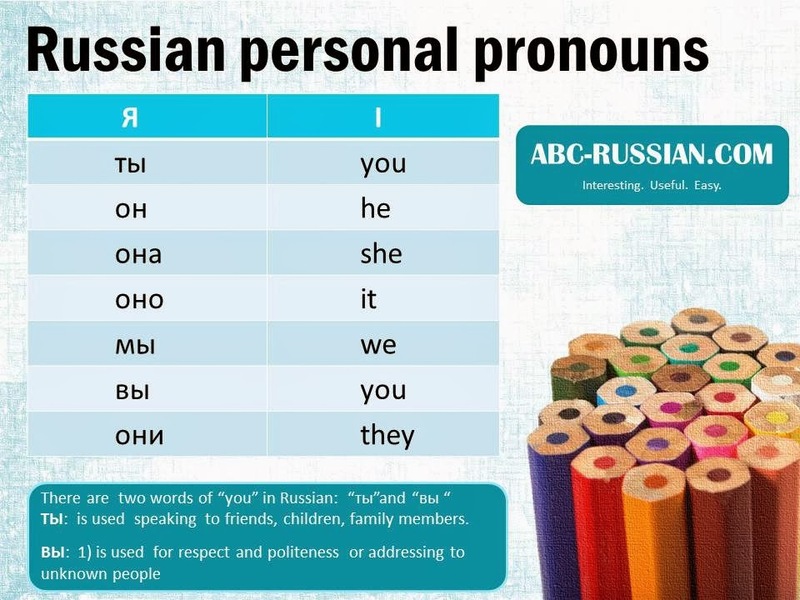 How to learn Russian personal pronouns? Personal pronouns can stand in place of a noun to indicate who or what is involved in an action. Это мой брат. Он очень добрый. This is my brother. He is very kind. Это моя новая машина. Она совсем новая. This my car. It is quite new. ( The Russian word "car" - is feminine, that's why we use " она". Read more : How to determine gender of Russian nouns? In Russian language there is no special word order for pronouns within a sentence - you can put the pronoun in any place in the sentence, but use the correct form of declension.